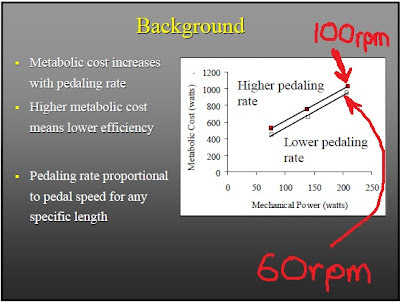 Some time ago I wrote an article about Myths in Cycling regarding crank arm length and cited Dr. James Martin's powerpoint entitled, ""Myth and Science in Cycling: Crank Length and Pedaling Technique"
As a result, I touched upon the topic of "ideal cadence", which has lead me to pursue this topic more thoroughly. Based on Dr. Martin's research and others, an ideal cadence for sprinting is around 120 rpm. This isn't too surprising or controversial. Sprinting is pretty straight forward. Just pure power in a short burst of usually 5 to 15 seconds. The side graphic shows this. However, the myth that he busts isn't on cadence's effect on sprinting; it's on standard crank arm length's effect on sprinting (basically there's very little difference between standard crank sizes on performance). Another interesting point about gear choice (which affects cadence) for sprinting is that for longer sprints such as 30 seconds versus 10 to 15 seconds, a bigger gear choice is desirable. Research shows that the reason for this is that muscle fatigue occurs more due to the total number of muscle contractions than by the duration of the contractions during extended maximal efforts. Basically it's more ideal to grind a bigger gear on a long sprint than to be "spun out", especially when another gear choice is available. 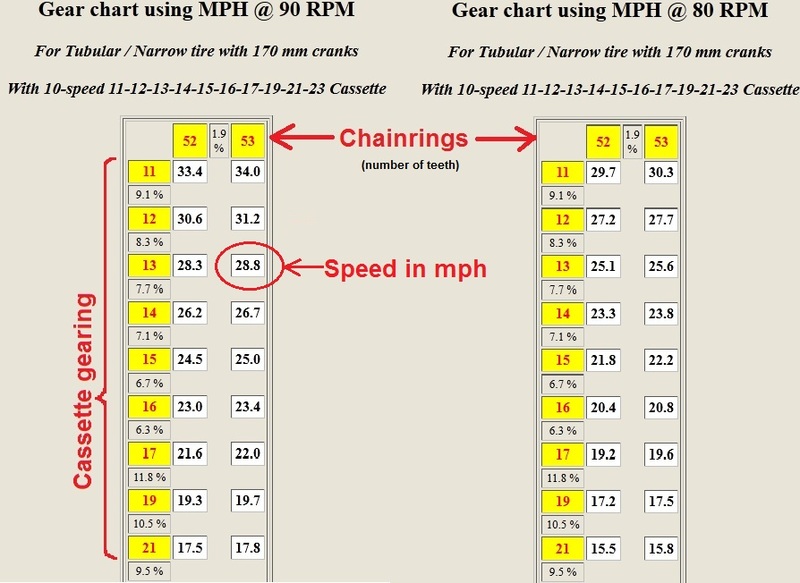 Below is a gear chart of speeds (via Sheldon Brown's Gear Calculator) produced using a 52 and a 53 front chain ring and a 10 speed cassette ranging from 11 teeth to 21 teeth. On a flat course most riders would sprint well in a 53/52 x 14 or 13. Professional riders may sprint in a 12 rear cog, and Kevin Sireau may use an 11 to sprint with. The information about crank-arm length from Dr. Martin is pretty clear. Standard sizes are nearly equally efficient, but the topic of ideal cadence came up and it generated a bit of controversy among my peers. I posted a data graphic that illustrated that 60 rpm cadence (pedal revolutions per minute) was more efficient than 100 rpm. The myth that this busted was that higher cadences are better for performance than lower. But hold the door, this isn't entirely settled. Several of my peers have challenged this idea. They point to examples of Lance Armstrong time-trialing at 100 plus cadence and beating the competition and the fact that The Cycling Hour World Record has been set with cadences above 100. Add to that the fact that most professional and elite athletes will generally ride at higher cadences (90-105) while racing as well. This naturally leads one to think that these riders must be riding at the ideal cadence and that lower cadences such as 60 is just wrong. So I set out to resolve this, and here's what I found: Both are true. Basically. I looked at dozens of research papers (see sources below) on the effects of cadence and efficiency and found over and over that Dr. Martin was right, but with a caveat. 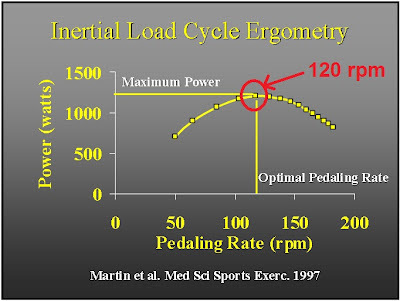 Lower cadences are more efficient for the vast majority of normal riders who do not have huge aerobic capacities and can not sustain large power outputs. 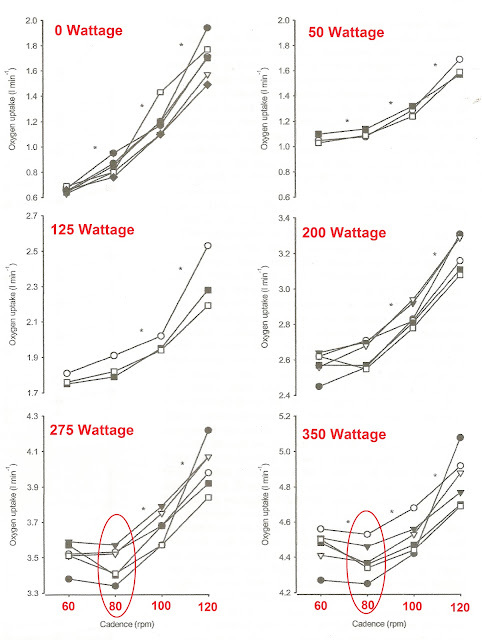 Two possible explanations for why efficiency and higher cadence numbers go up as power output goes up for elite and professional riders. One is heat generation within the muscle fibers and the other is muscle composition. 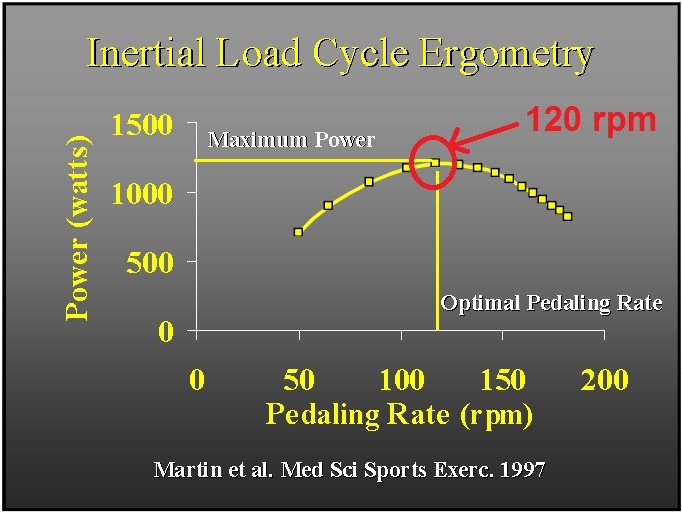 Cyclists across the board are generally only about 24% efficient when pedaling. Efficiency is a measure of work performed for energy used. Or for cyclists we'll say, less oxygen used, less fuel burned, means more efficient. Net mechanical efficiency for muscle movements is generally low for all cyclists due to the loss of free energy as heat. As power output increases, so does the temperature within the muscle. This temperature factor may have an effect on efficiency with the speed at which a muscle contracts (or cadence). Additionally, it matters which type of muscle fiber that is contracting. Fast twitch and slow twitch fibers have different contractile properties in terms of efficiency and optimal speed of contracting. As work load (or power output) goes up, more and more muscles fibers are recruited to do work. As a result of either-and-or heat build-up in the muscle fibers and the type of fiber being recruited, both efficiency and cadence go up as power output increases. Take a look at the graphic below. It's a great illustration of how elite riders become more efficient with higher cadences at greater levels of power output. This data comes from Øivind Foss and Jostein Hallén's article, "The most economical cadence increases with increasing workload" It is extremely important to note that the six rider's in this study are elite cyclists with a VO2 max of an average of 69 ml/kg/min which puts them far outside of the power output of most cyclists. These elite riders are capable of sustaining 350 watts for an hour (time trialing around 29mph) whereas a cat 5 or untrained rider can only sustain from 130 to 200 watts for an hour (time trialing around 20-23 mph). Big difference. Now lets discuss cadence in practical terms regarding racing. 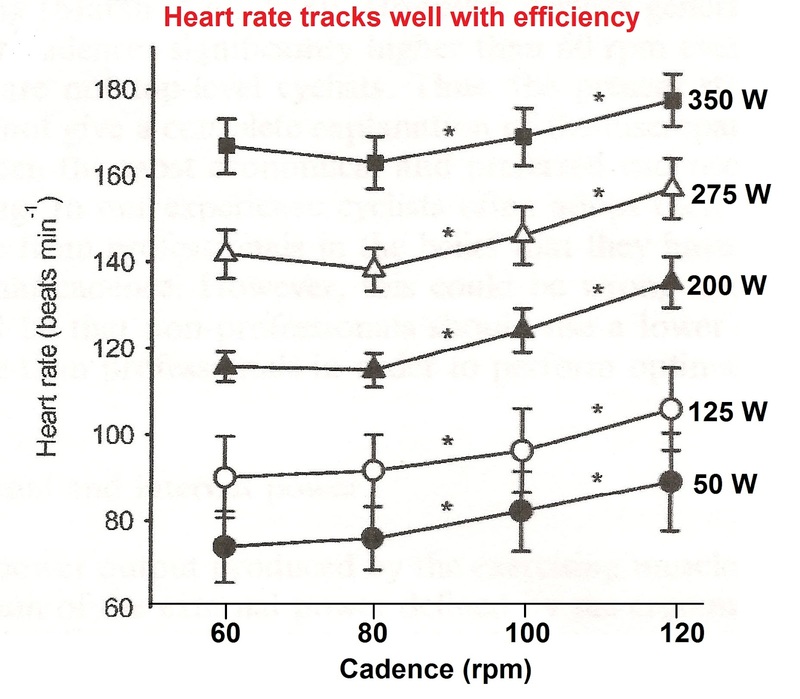 Cadence should largely be ignored during criterium racing. No more thought should be applied to cadence in criterium racing than to what your respiratory rate is (that is zero). 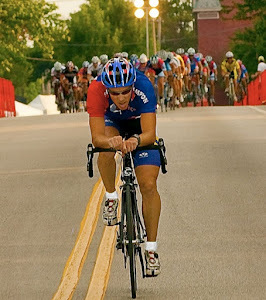 The focus should be staying close; tight in the draft of the cyclist in front of you at all cost. The reason for this is that the efficiency of drafting can be upwards to 36% energy savings whereas ideal cadence may only be single digit percent savings of energy. With that said, it is also worth mentioning that the nature of criterium racing is very much "gas on- gas off" (full power and zero pedaling), high cadences are easier for accelerating and a bit easier on your connective tissues in your knee and leg (especially with long riding without rest or variation). Again, for criterium racing, focus on drafting and let cadence take care of itself. Ideal cadence is more important for time trialing, where every second counts, because it's a race against the clock. 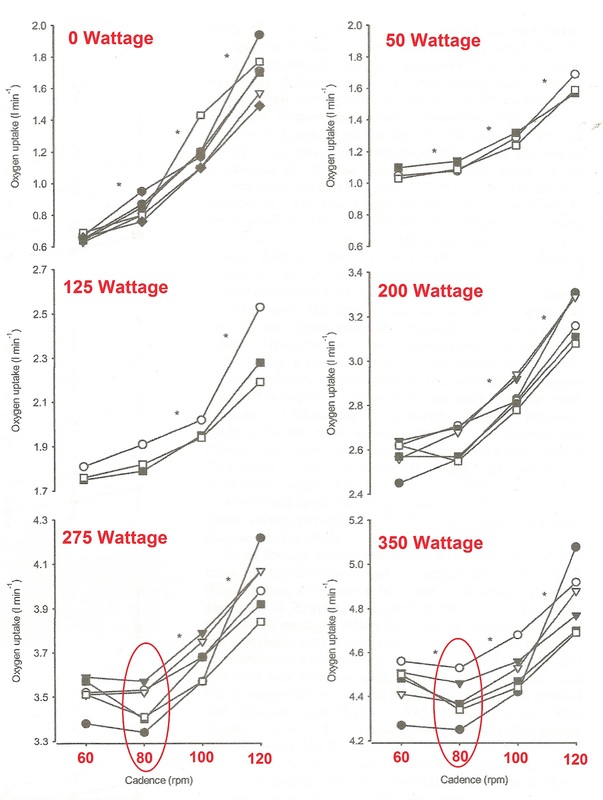 In the case of the elite cyclists above, clearly an 80 cadence is the most efficient to ride at (coincidentally 350 watts happens to be their average lactate threshold). Time trialing at a lesser efficient cadence of 60 or 100 would cost approximately 9 watts of power (my estimate) and would result in about a 30 second time difference over a 40 kilometer time trial. (my calculations come from the American College of Sports Medicine formula and the bike calculator). So an ideal cadence is important. But here's the problem. It is not possible to maintain exactly 80 rpm while time trialing at a maximal effort in the real world for several reasons. Firstly, there is a fairly big change in the power requirement between gear changes at a fixed cadence. See the gear chart below to see what I mean. There's about a 2.1 to a 2.8 mph difference between gear changes, which translates to a difference of nearly 100 watts of power in the upper gear sizes. Additionally there are several other factors beyond power that affect you on the road, such as wind changes and road grade changes. 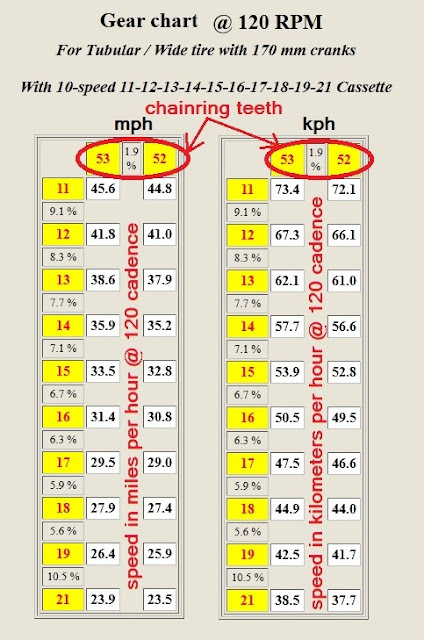 As a result, cadence (and often gearing on hilly courses) must constantly be adjusted for these factors. The elite riders studied in Øivind Foss and Jostein Hallén's article, "The most economical cadence increases with increasing workload" (first chart) have an average VO2 max of 69 and a weight of 78 kg (or 171 lbs) and as a result we would expect them to ride a 40k time-trial at about 28.65 mph (full aero equipment, flat terrain, zero wind, 100ft elevation). There's no data point on the above gear chart for an 80 cadence gear combination that gives us this exact speed. However the 90 cadence gear chart (above left) does put our riders very close to the speed of 28.65 with the gear combination of 53 x 13. Of course, we know from our earlier discussion that 80 rpm cadence is around 9 watts and 30 seconds faster for our riders than a 90 cadence. So what can be done? The best that can be done (for our elite riders) riding with a 53 tooth chain ring is to select a 12 rear cog and pedal at a slightly elevated cadence of 83 rpm. 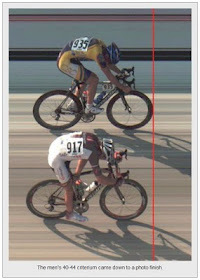 The 9 watts and 30 seconds advantage will be reduced proportionally (est. 6w, 20s). This is far easier done in a lab than in the real world! A good example of real world riding is illustrated in the SRM data from my 2010 State Time Trial, which was raced on a flat course. I did not focus on cadence, but instead focused on my effort, shooting for an average of 345 watts. Because of the changing wind conditions, my speed and cadence would go up and down, but I maintained a fairly consistent power output. Looking at this graph with my current knowledge, I may have had a bit of a benefit from a slightly higher cadence in the later half. Below: The purple is speed, blue is cadence and green lines are wattage. The drop down spike in the center is the turn around point. 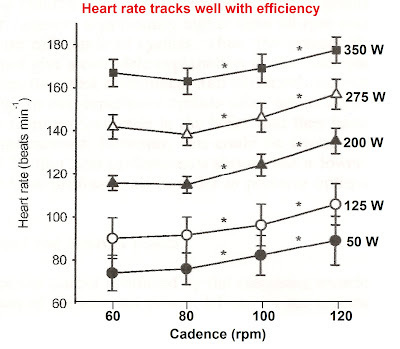 The above graphic shows the relationship between cadence, heart-rate and power and comes from the same study of the elite riders as mentioned above. Found that professional riders spontaneously adopt higher cadences (around 90) during both time trialing and group riding, but tend to adopt a more economical pedaling rate of approximately 70 rpm during hill climbs. Efficiency increases in scale with pedaling rate as workload increase. This study demonstrated that elite cyclists perform best at their most efficient cadence which was 80 rpm, despite the maximal energy turnover rate being larger at a higher cadence. In short, you should choose a cadence that mirrors your power output; unless you’re an elite rider, it’s unlikely you’ll benefit from using cadences exceeding around 80rpm. However, world-class athletes can push into 100 rpm range for the most efficient cadence that will produce the greatest performance. To see where you stack up in the field of competitive cyclists, see my post: Comparative Measurement of Maximal Outputs for Cyclists. This is a great article. It is really in depth and well researched. What I gathered most is that the cadence you choose is not the same for everybody. You should choose a cadence that is the most economic for your body at your current fitness level. One thing though... I am curios at what point does a competitive cyclist think it will be a good idea to start riding at a higher cadence than 80? It seems kinda odd that you would train at around 80 cadence for several years and then switch to a higher cadence to improve efficiency. My article is a bit obsessive regarding the ideal cadence for racing performance. Generally the topic of the ideal cadence should be ignored by most cyclists during the act of bicycling. Instead they should simply choose a gear that they feel comfortable bicycling with. This is even true with criterium racing where cadence will vary widely and rapidly (literally from 0 to 120 with an average typically between 80-100 rpm). 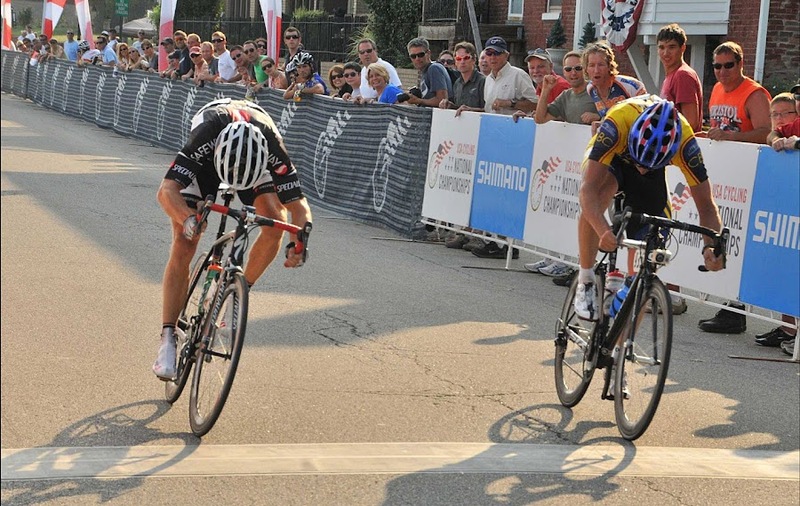 Instead drafting should be the primary focus during criterium racing. As to your question: when should a rider begin to focus on an ideal cadence? In my opinion: anytime when they have an interest and a need, specifically all professional riders should be informed and knowledgeable of their own personal ideal cadence for time trialing performance and any others who would like to increase their performance in time-trials. This can be determined by testing and identifying which corresponding cadence matches with the lowest heart rate at any specific power output. Lastly, in regards to the timeline of when should a rider take notice or adjust their cadence: In the case of individuals with elite or world class ability, they will develop quite rapidly (within their first year they will be able to produce lots of power very quickly and will have a high VO2 max that matches), therefore they will benefit from higher cadences earlier on. Regardless of when a rider adjusts up or down to a more ideal cadence the results will be instant and adaptation (psychologically and physically)will not be far behind). Some riders will take longer to develop, but the majority of their physical improvement will occur within a few years. I hope this helps, and good luck with your cycling. Over my winter training with a new PowerTap (and Golden Cheetah to analyse), I've been SHOCKED to discover for durations more than 2-3 minutes I can easily sustain higher power outputs at 80-82 rpm than the 90-95 rpm I'd been racing the previous seasons. Even better, a chronic foot issue in my metatarsals that crept up a few seasons ago has almost completely vanished at these "lower" rpms. I'm putting out higher power longer with no pain. it's funny that you talk about LA in that manner, and yet say that you should Ulrich up the hills... LOL. Come on mate, they were all boosting themselves up the races. I'ts really a great post. Your content are very informative and relevant. The Restaurant Network, The place where restaurants and suppliers connect. Free and easy to access to find good restaurants around the world. Really great article David Henderson so thanks very much. I wonder if 69VO2 max and 171lbs is really "elite" though. Another factor -- when top riders are training for higher cadences, my understanding in part was that the muscular damage might be lower, and thus, for something like the TdF, it is useful to do 90-95, even at sacrifice of a few watts, if you've gotta do it every day. Training regularly and strategy can help you a lot in winning such race, well this ideal cadence would be a big help for those who wants to soar high in bicycle racing. Dr. Ferrary (Lance Armstrong's doctor) was studying how high cadence will benefit Lance while he's doped. I would assume with something that increases his aerobic capacity. So this way Lance will benefit from this drugs more than if he were using lower cadence. Anyway, all these scientific studies you did on clean riders don't apply to juiced riders. They have their own studies and you don't even know that and assuming they have nothing in their system to help them. So all your studying is BS if your data based on both clean riders and the riders who're juiced, but you don't even know that they are juiced.